Can Martin and Nan keep it together? Has the Downward Dog TV show been cancelled or renewed for a second season on ABC? The television vulture is watching all the latest cancellation and renewal news, so this page is the place to track the status of Downward Dog season two. Bookmark it, or subscribe for the latest updates. Remember, the television vulture is watching your shows. Are you? 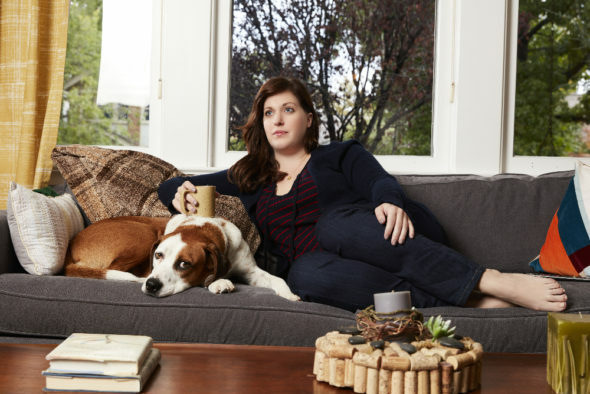 Airing on the ABC television network, Downward Dog stars Allison Tolman, Lucas Neff, Kirby Howell-Baptiste, Barry Rothbart, Siovhan Christensen, Ayden Mayeri, Andrew Gorell, Sam Hodges (voice), and Ned the dog. The sitcom centers on Nan (Tolman), and is narrated by her philosophically inclined and rather forlorn dog, Martin (voiced by Hodges). Martin tells Nan’s story from the perspective of woman’s best friend. The series explores the ups and downs of modern-day human life, through the eyes of a devoted dog. The first season of Downward Dog averaged a 0.71 rating in the 18-49 demographic and 3.47 million viewers. Find out how Downward Dog stacks up against other ABC TV shows. On June 23, 2017, Downward Dog was cancelled. There will be no second season on ABC, but the creators say they’re not giving up on it. Stay tuned for further updates. The ratings have been pretty bad so it’s clear that this freshman comedy can’t stand on its own four legs. I expect this one to be cancelled after one short season. Subscribe for free updates on all Downward Dog cancellation and renewal news. 6/23 update: ABC has cancelled Downward Dog. The creators, however, aren’t given up on it. Details here. Find more Downward Dog TV series news or other ABC TV show news. What do you think? How do you feel about ABC cancelling its Downward Dog TV show? Would you follow this TV series to another network? Please renew this show on a better network that can appreciate all of us dog lovers out there. We loved this show! So cute. More about the dog though than her work life. Please bring downward dog back!!! I LOVED IT!!!!! Please netflix pick up dow ward dog. I mean season two and more.